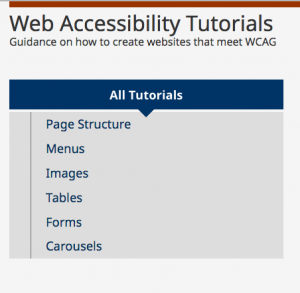 Updated Web Accessibility Tutorials on Menus, Page Structure, Forms, Images, Tables, and Carousels were published by the Education and Outreach Working Group. Updates are listed in the changelog. These tutorials show you how to create web content that is accessible to people with disabilities and that improves the user experience for all users. They include general guidance, and specific examples for HTML5 and WAI-ARIA. Learn more about the Web Accessibility Initiative (WAI).